This Gothic Revival church replaced an earlier chapel on the same site, part of which survives as the church hall. 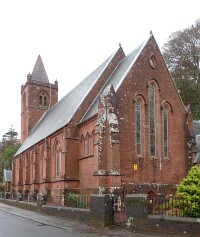 It was built to serve the affluent resort village of Skelmorlie, and its rich furnishings reflect the prosperity of its Victorian congregation. Authorship: John Honeyman was responsible for the design of the church: he made site visits at the planning stage, and he is named as architect in a contemporary account written by the minister. However, the distinctive style of some of the furnishings and fittings suggests Mackintosh's involvement. In particular, the unusual wrought-iron lamp standard outside the main entrance is very similar to the one shown in Mackintosh's 1896 perspective drawing of Martyrs Public School, and it was probably designed by him. Alternative names: Skelmorlie and Wemyss Bay Parish Church.